Maurits Cornelis ESCHER (1898 – 1972) is one of the most famous Dutch artists for the large (international) public, after Rembrandt and Van Gogh. Exhibitions of his work attract a lot of visitors. His work is immediately recognized by everyone, his visual language is firmly anchored in our time and inspires scientists just as easily as comic artists and filmmakers who intensively ‘reuse’ his impossible worlds in new own creations. New generations are just as intrigued by his work as his contemporaries. What has made his work known and with such a wide public? The fascinating thing about Escher is that in his work, he shows a realistic, recognizable world for everyone. Everyone understands what he sees without explanation. Everyone knows what a bird looks like or a fish, but that their shapes fit together … “Why have I never seen that …”. And “how can it be that I see either positive or negative images, but they can never be perceived at the same time?” Ever since ancient times, artists have been looking for a representation of the three-dimensional world that is so realistic that the flat surface is forgotten, but Escher does a step further: his realistic threedimensional worlds turn out to be impossible dream worlds on closer inspection. “How does he do that, why do I see something that is not possible”. Escher challenges to participate in his ‘mind-games’ and takes his viewers along in his ‘conceptual’ art. As an artist he might be compared with an ingenious inventor: his invention has an enormous impact, but at the same time it is so simple that everyone asks himself why did not I have that idea. But who was Escher? How did he get his ideas and inspiration, how did he live? Who was that brilliant graphic artist who continuously and fanatically continued to work and finally surprised the world with his work and astonished himself with his enormous success, especially among the youth? What were his deeper motives? His fascinating prints are extensively covered in numerous publications, but the man behind the artist, who has so much impact until today, often remains in the shadow of his work. His world renown justifies a long documentary that makes it clear who this man was. For many years filmmaker Robin Lutz had the desire to dive into Escher’s work and to make a long documentary about him. The moment to put this long-cherished dream became reality when it was clear that 2018 would become an important Escher year in the Netherlands as well as internationally. M.C. Escher is one of the famous sons of Leeuwarden where he was born in 1898. But also that The Hague, where the only museum in the world dedicated to this famous graphic artist, ‘Escher in het Paleis’, is located, has plans to open a new and larger Escher museum. This expansion is possible because The Hague has the largest Escher collection in the world, before the National Gallery of Canada and the National Gallery of Washington. In addition, several large exhibitions of Escher will be on the scene in the coming years, including in Korea and New York. All excellent opportunities to introduce a broad public to the man behind his world-famous work. Robin Lutz realized the film in collaboration with the art historian Marijnke de Jong. Together they made contact with the Escher Foundation, which manages all rights of the Escher estate. They were given full cooperation and the exclusive permission to make a documentary about the life and work of Escher. 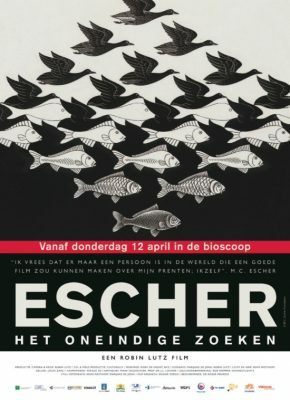 In the context of ‘2018 Leeuwarden Cultural Capital of Europe’, alongside the release of the film in the Fries Museum in 2018, a large Escher exhibition will be organized. Escher’s numerous letters and diaries that they digitized and put on date for more than 18 months. On the basis of this material Escher gives in his own words a very poignant and personal picture of his life with all his fears, doubts, successes, political reflections and his wonder and of course his ‘vision’ of his own work. The viewer is taken in his lifelong search, his emotions, his playing and his puzzling. Escher’s written sources show how much he actually chose his own way from a young age. His parents let him free in his choices and supported him financially, but had serious doubts about his choice. Escher showed self-confidence, however his personal documents show his enormous doubts and his need for recognition. Yet his urge to prove himself and his doubts did not prevent him of going his own way; he did not make any concessions to himself and was convinced that hardly anyone understood him and that he was the only one who could say something sensible about his work. The broad spread of his work was important to him, although he did not understand why he had such a success: he observed the world around him but could not follow that same world. The story of the film is made in the ‘I’ form. The audience looks through the eyes of Escher himself in the film, the camera is Escher. He takes us on a journey through his life in his own words and explains what fascinated him in Italy where he lived for almost 20 years. 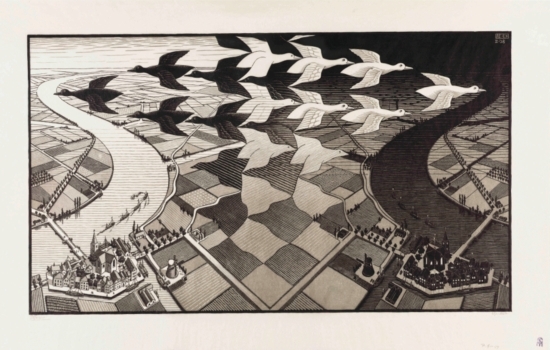 The viewer follows Escher on his travels through Italy, Switzerland and Spain in search of inspiration and experiences how he came to his great works, while puzzling. The film starts and ends in the present. Although Escher himself understood nothing of the popularity of his work, it is anchored in the DNA of the present time and is frequently ‘quoted’ as in comics, in advertising, in feature films, tattoos, dance, etc. His inventions still keep people always busy and inspiring. Personal photos and unique historical film fragments together with Escher’s own words provide a huge extra depth to this film. To make the ‘impossible world’ in his prints cinematically clear, the film uses realistic 3D animations that help the viewer understand how Escher thought and eventually came to his particular vision and work. In the film we see drawing and film material that has never been shown before and makes it clear how much effort Escher it took to make his prints. A lonely process of weeks and months of headaches and puzzling to make that one print that he had seen with his mind’s eye for a long time. ‘As beautiful as I see it in my head, unfortunately my prints will never become like that’ says Escher. Luckily, millions of people around the world think differently about this. In order to place Escher’s own story in context, interviews are used with the sons of Escher. Their testimonies are a direct supplement but also a reflection of their own story. The same goes for the icon pop star Graham Nash who confirms Escher’s influence. Graham Nash is a great collector of Escher’s work and has discovered ‘art’ thanks to Escher. Besides being a singer and collector, he is also a publisher of art books and can tell about the influence that Escher had on his world and that of an entire generation in the sixties of the last century. Although in his time often maligned by art historians, Escher is an artist of world renown to the general public. 44 years after his death, Escher tells his personal story and the man Escher emerges from the shadow of his work. You cannot come closer to Escher. The premiere will be on April 9 in Leeuwarden, the Cultural Capital of Europe. As per April 12, the movie of Robin Lutz will be shown in the Pathé cinemas in 25 cities. At the end of April the English version is to be seen.